In 1996, Gordon Lark said good-bye to a beloved friend. His dog Georgie died of an autoimmune disorder that had turned the animal’s body against itself. Lark knew he would dearly miss his pet, but what he didn’t know was that Georgie’s passing would spawn a unique partnership between dogs and people: one that may one day find a treatment for the disease that took her life. Lark had acquired Georgie as a stray 10 years before. Despite not knowing much about the dog, he quickly fell in love with her and with her breed, the Portuguese Water Dog. For centuries, these sturdily built dogs were a favorite of coastal Portuguese fisherman. Hard-working and obedient, they have boundless energy and exceptional swimming and diving skills. breeder who at the time was living on a New York horse farm an hour north of Manhattan. She had a cute puppy, Mopsa, in mind for Lark. Miller didn’t ask for money in exchange for Mopsa. But she did ask for something else: Miller told Lark that he could keep Mopsa on one condition: that he begin genetic research studies with Portuguese Water Dogs. To Miller, studies of how heredity contributes to appearance, behavior, and overall health would provide useful knowledge for breeding healthy dogs. And Lark, a biologist at the University of Utah in Salt Lake City, had the skills for the job. But the proposal wasn’t exactly what Lark was expecting. His immediate plans were retirement, as his wife Cynthia, also a biologist, had done a few years before. She died of Alzheimer’s disease in 2006. Lark faced a new chapter in his life, and he wasn’t convinced that research with dogs would be part of it. What is the Georgie Project? Until Georgie died, Lark’s scientific specialty was soybeans. For many years, his genetic research had centered on looking for the inherited factors that affect soybean nutrient quality and growth characteristics. But although he had never studied Water Dogs, it didn’t take long for Lark to become sold on the potential value of studying their genes. He learned that all Portuguese Water Dogs alive today descended from relatively few original dogs, called founders. This simplifies DNA studies because the gene “pool” within this breed is relatively small. Tracing genes to traits is easier. 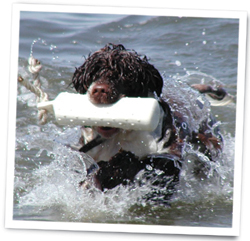 Within a couple of months after sending Mopsa to Lark, breeder Miller shipped 5,000 Portuguese Water Dog pedigrees. Detailed records of health and breeding characteristics, pedigrees are a treasure trove for genetic researchers. In addition to accurate breeding records, pedigrees are a rich source of information about physical characteristics like size, build, color, disease, and behavioral attributes. Lark, Miller, and others soon launched the “Georgie Project,” to begin studying the genetics of Portuguese Water Dogs. The research effort was privately funded for 5 years until the National Institute of General Medical Sciences, one of the National Institutes of Health, stepped in to help support the work (the project is still partially privately funded). In a decade’s time, the endeavor has contributed valuable knowledge about the genetic basis of health and disease. It has also introduced hundreds of pet owners to research that helps inform the health of all Portuguese Water Dogs and humans, too. One of the greatest gains of the Georgie Project—and, in fact, an intended goal—was learning how scientists and the general public can work together toward the common good. “We teach each other,” says Lark, adding that owners, breeders, and researchers each have something to offer intellectually. The benefits of autopsy to medical research are enormous. Modern medicine got its start, for the most part, from making connections between a patient’s symptoms and diseased organs found after death. Autopsy has several purposes and benefits. Examining a body after death can confirm or disprove a clinical diagnosis. For people, this is important when the cause of death was an inherited disease. Other family members can learn about their own risk. and 150 owners have consented to the procedure when their pet dies (akin to a living will). Georgie Project chief scientist Gordon Lark says autopsies tell much more than just the cause of death. Detailed information about all the dogs’ organs and tissues, in addition to their DNA, provides a wealth of research data. This can help researchers make links between genes and disease. Georgie Project staff work with owners and veterinarians to obtain the body of a deceased pet. Despite the emotional and logistical difficulty, owners have been ready to comply. The Project pays for transport of the dog’s body and, through arrangements with a pet cremation company, returns the pet’s remains to its owner after the autopsy is complete. Lark knows nearly all the dogs that die and personally shares in an owner’s sorrow. Water Dog breeder Karen Miller, who works closely with the Georgie Project, says more than one owner has been touched by Lark’s extraordinary devotion. “Gordon called and cried with me,” one owner told Miller. To date, the Georgie Project has involved approximately 1,500 Water Dogs and their owners, and dozens of scientists. Some, like Lark, are also owners. Georgie Project dogs have been analyzed for many different things ranging from blood chemistry and DNA variation to behavior, body shape, and bone structure.Since dogs and people live together, we have similar “conditioning triggers.” We breathe the same air—and all its unseen pollutants—and bathe in the same water. We walk and run barefoot through the same grass. Water Dog owners’ veterinarians take X rays of their dogs. Georgie Project scientists record precise measurements of bone shape and size. The round circle (top, right) is a quarter coin used to calibrate the image. That’s important because many diseases, including autoimmune disorders like that which claimed Georgie– are thought to have environmental influences. Perhaps the most important result the Georgie Project has turned up is that purebred dogs can be studied easily at home. The dogs do not even know they are part of a research study. Portuguese Water Dog owners such as Jean Hassebroek of Sargents Bluff, Iowa, have found it relatively simple to get involved. “I just contacted them and they sent me a kit,” she says. Georgie Project staff provide instructions for the owners’ veterinarians to take X rays that cover the entire body of the dog, she explains. The vets are also asked to collect blood and hair samples for DNA testing. Hassebroek has enrolled half a dozen Water Dogs in the project in past years. One of the best things about it, she says, is that her dogs are at home with her, not in a lab somewhere. an autopsy when their pet dies, the project mails the ashes back with a note commemorating the dog’s service to science (see “Life After Death”). People have had dogs as pets for just a fraction of the time that humans have lived on this earth. Yet the variety among dogs is astounding: Compare a Chihuahua to a Great Dane, or a Labrador Retriever to a Poodle. Through selective breeding, there are more than 400 very different types of dogs throughout the world today. Dogs suffer from more than 350 inherited diseases, and up to 300 of these are similar to conditions in people. Some of the most common are cancer, epilepsy, heart disease, allergies, retinal disease, and cataracts. Geneticist Elaine Ostrander of NIH’s National Human Genome Research Institute is an expert on dog genetics. She also works with Lark on the Georgie Project. 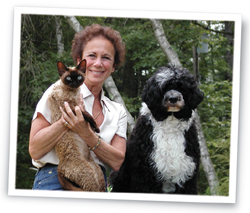 Portuguese Water Dog breeder Karen Miller works with the Georgie Project. Ostrander’s research has found substantial overlap between diseases that strike dogs and people. “The genetics of bladder cancer is difficult to study in humans,” Ostrander says, noting that this cancer is quite common in Scottish Terriers and West Highland White Terriers. One of the things the Georgie Project has taught researchers is that some cases of Addison’s disease, a condition relatively common among Portuguese Water Dogs, may appear along with a complex syndrome involving several organs in which the immune system rejects its own components as foreign and launches an attack on the body. Two types of alternate DNA spellings, called genetic variants, have been identified in the DNA of Water Dogs with Addison’s. One of them is the same as in the DNA of people with this disease. Assassinated U.S. President John F. Kennedy had Addison’s, as did English novelist Jane Austen and comet-discoverer Eugene Shoemaker. Research is ongoing to unravel Addison’s and potentially related autoimmune conditions that appear to be much more complicated than once believed. The Georgie Project continues to provide clues. The Georgie Project also unearthed the surprise finding that a single spot of DNA—that controls the activity of a growth gene—accounts for whether a given breed will be large or small. By studying hundreds of Water Dog DNA samples, Georgie Project researchers learned that this genetic variation explains why Pekingese are tiny and Irish Wolfhounds are huge. Water Dogs are somewhere in between: faster but less forceful than American Pit Bull Terriers, but slower and more forceful than Greyhounds. In a broader sense, The Georgie Project has brought together a vibrant community of animals and people teaming for better health. “It’s a cool way to be doing something good for humanity,” owner Hassebroek says. Want to do cutting-edge medical research in the comfort of your own home? If you have a purebred dog as a pet, you could help scientists learn more about the health of dogs—and people, too. The Canine Genome Project, funded in part by the National Institutes of Health in Bethesda, Maryland, is a huge team project that involves scientists all over the world. It also involves a bunch of different dogs and owners who never spend a day in a research lab. The goal is to thoroughly understand the canine genome, or dog DNA. The researchers want to know how heredity contributes to traits like a soft, silky coat or the ability to deftly herd a flock of sheep. The scientists also really want to know how DNA changes affect health and sometimes cause disease. By examining DNA differences between breeds, within breeds, or in particular disease states, researchers are closing in on some of these connections. The results are expected to help breeders make decisions about which pairs of dogs to match up, and also to provide new hints about the 300 or so diseases that both dogs and people get.